The exciting packaging for this chocolate attracted me on a visit to pick up ready meals and upon reading the details I thought I'd give it a shot. 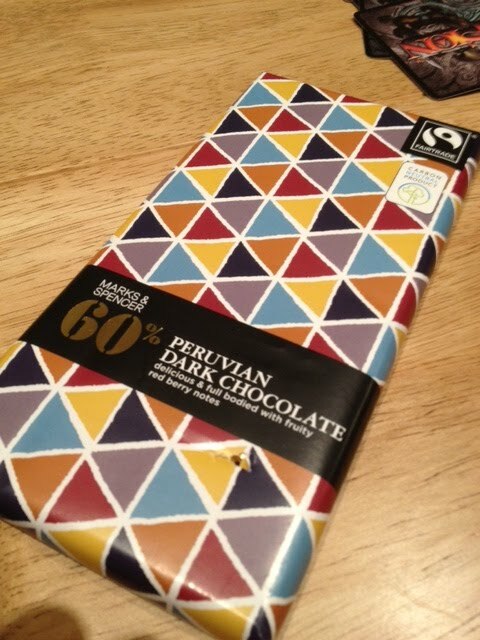 A 60% strength choc is well below where I'd usually start shopping, but this promised fruity overtones without adding nasty raisins to the mix. And largely this works, it's a very edible choc and tastes like there is a red berry mix going on in the background. The packages says this is due to selection of cocoa beans, which means the chocolate is pure and smooth. I'm not a fan of sitting eating lots of chocolate but while sitting playing board games this got pretty much demolished. I know that M&S do their own ranges of a lot of thing but I'd never considered their chocolate would be anything other than bargain basement fare. This is a pleasant surprise and well worth investigating.